Malaria and filaria both cause important public health problems in India. The number of cases of malaria in India in 2014 was 1.10 million. Filariasis is endemic in 17 states and 6 union territories in India, with about 553 million people at risk of infection. In India, various species of mosquito transmit three species of Plasmodium, namely – Plasmodium falciparum, Plasmodium vivax, and Plasmodium malariae. Anopheles culicifacies is widely distributed and is the principal vector of rural malaria, Anopheles stephensi is the primary urban vector, and Anopheles fluviatilis is a vector in hills and foothills. Culex quinquefasciatus is the principal vector of bancroftian filariasis in India. Though vectors of both the diseases are different, they can be transmitted by a number of common vectors, and hence both the diseases can be co-endemic in few areas of the tropics. Epidemiological studies in South East Asia, Papua, and New Guinea have revealed concomitant parasitism of malaria and filaria in human communities. In these areas, however, anopheline mosquitoes are vectors for both malaria and lymphatic filariasis, which is unlikely in India. The present case highlights the concomitant parasitism which is a rarity in India, and as per literature search, there is only a single study on concomitant parasitism from India (Orissa) in 1998. Further, in the present case, certain unusual forms called “crisis forms” of P. vivax were identified which are rarely seen. A 22-year-old male patient hailing from northern India was brought in a state of altered sensorium. The history obtained had complaints of fever with chills of 3 days' duration. General physical examination revealed mild pallor, high temperature (103°F), and low blood pressure (80/60 mmHg) with hepatosplenomegaly. 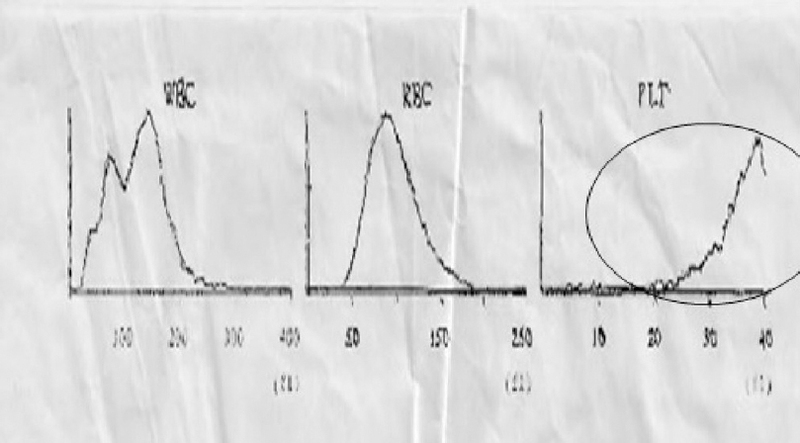 Complete hemogram revealed Red blood cell count of 3.77 million per μl, hemoglobin of 10.2g/dl and red cell indices within the normal limits. The platelet count however was low at 44000/ μl, and the white blood cell count was within normal range. Differential count: Polymorphs – 64%, lymphocyte – 31%, eosinophils – 03%, and monocytes – 02%. 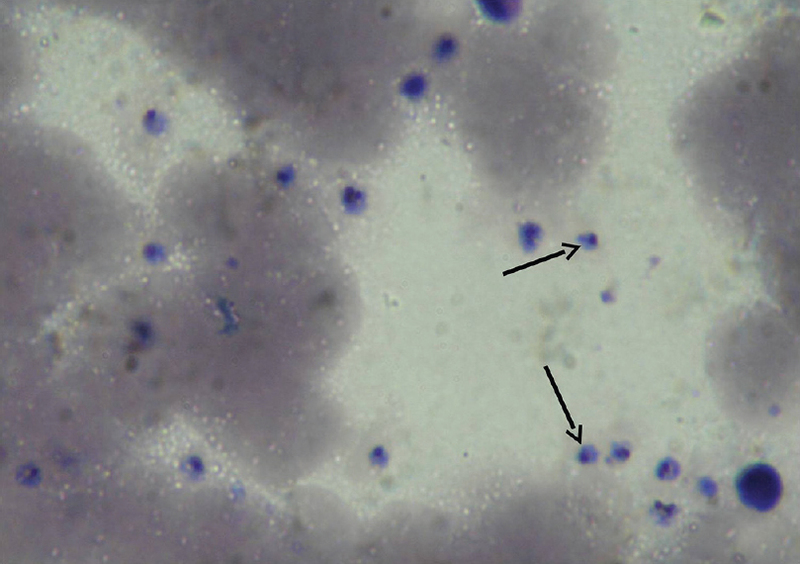 Peripheral smear showed many bluish ameboid structures with the presence of blackish-brown pigment, and these structures were placed outside the RBCs [Figure 1]. These were identified as crisis forms of P. vivax, i.e., abnormal and disintegrating parasites. 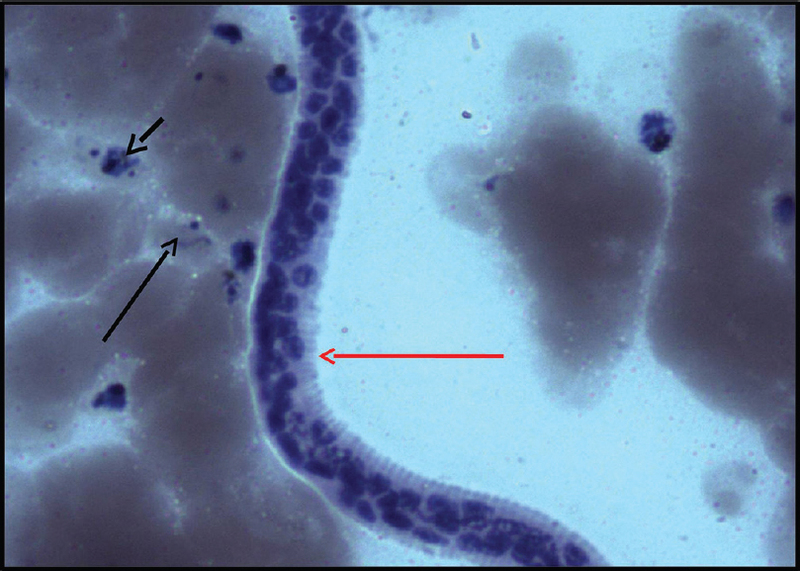 A careful search revealed trophozoites of P. vivax within the RBCs and an occasional microfilaria of Wuchereria bancrofti species [Figure 2]. The cell counter showed spurious results of platelet count of 42,000/cm compared to the much lower platelets observed on peripheral smear. The spurious platelet count was anticipated as the possibility of crisis forms being counted as platelets by the three-part differential cell counter (PCE 210, ERMA INC). The same was evident in the histogram of the platelets [Figure 3]. Biochemical parameters were within normal limits. In areas endemic for malaria, infection with other blood-borne parasites are common. Hence, concomitant parasitism appears to be a common feature. However, information on the occurrence, prevalence, and interaction of the two diseases in humans is scant. A large study conducted on mosquitoes by Muturi et al. in Kenya showed that coinfections of malaria and lymphatic filariasis in the population are more likely to occur when the prevalence of both diseases is high. Filarial nematodes co-occur with malaria in human populations and can even be carried by the same individual vector. A study carried out in Orissa reports an incidence of 0.3% of malaria-filaria coinfection. Coinfection of malaria and filaria poses a diagnostic issue that is related to early detection of filariasis as symptoms of filariasis appear late in the course of infection unlike malaria. Hence, filariasis cannot be diagnosed before the onset of symptoms. Severity of malaria depends on the immunopathological component. The helminthic coinfection readily affects the immune system, altering the presentation of malarial infection. Delicate immunological balance is required that is readily upset by helminthic infection. The immune system must strike a delicate balance to kill parasites yet modulate the pathological overproduction of cytokines. Crisis form is the term used to describe abnormal and disintegrating parasites. These forms are not routinely seen in smears of P. vivax cases. They are usually associated with severe infections accompanying near fatal increases in parasitemia and are attributed to immunological mechanisms. In the present case, these forms were probably seen as a result of exaggerated immunological response due to filarial coinfection. Patients who have malarial–filarial coinfection further can be categorized into two groups, namely those who show the presence of microfilaria (Mf) in blood (Mf +ve) and those who do not show microfilaria in blood (Mf −ve). Studies have shown that Mf +ve patients have increased IFN-γ and downregulatory immune machinery (interleukin-10 and transforming growth factor-beta); hence, the severity of malaria is less in these patients. Conversely, Mf −ve patients have effector impairment and absence of immunomodulation and hence more severe malaria. Thus, it is very important to do a careful search for coinfections in cases of malaria, especially in areas endemic for helminthic infections. It is essential to identify and document coinfection as the presentation, behavior, and treatment of these patients differ from the conventional cases. Research studies need to be carried out extensively to assess the effect of timing of coinfection as it is still not completely understood if malaria came first and whether the severity of malarial disease is altered by incoming filaria. In the present case, the patient responded well to the antimalarial and antihelminthic drugs. Parasitic coinfections although rare should always be looked for by diligent examination of the peripheral smear. Awareness of unusual forms of malaria is essential and is highlighted in the present case as it may be a clue to the presence of a coexisting second infection. Further, spurious rise in platelets in the hemogram should be dealt cautiously, and documentation of any abnormal forms of malaria if present should be highlighted in the report. The present case further emphasizes the importance of peripheral smear examination which still remains the gold standard, especially in diagnosing parasitic infections. We thank the CDC team, Atlanta, for identifying and opining on the crisis forms. Raju K, Jambulingam P, Sabesan S, Vanamail P. Lymphatic filariasis in India: Epidemiology and control measures. J Postgrad Med 2010;56:232-8. Ravindran B, Sahoo PK, Dash AP. Lymphatic filariasis and malaria: Concomitant parasitism in Orissa, India. Trans R Soc Trop Med Hyg 1998;92:21-3. Muturi EJ, Mbogo CM, Mwangangi JM, Ng'ang'a ZW, Kabiru EW, Mwandawiro C, et al. Concomitant infections of Plasmodium falciparum and Wuchereria bancrofti on the Kenyan coast. Filaria J 2006;5:8. Chadee DD, Rawlins SC, Tiwari TS. Short communication: Concomitant malaria and filariasis infections in Georgetown, Guyana. Trop Med Int Health 2003;8:140-3. Graham AL, Lamb TJ, Read AF, Allen JE. Malaria-filaria coinfection in mice makes malarial disease more severe unless filarial infection achieves patency. J Infect Dis 2005;191:410-21. Jensen JB, Vande Waa JA. Epidemiological and immunological aspects of human crisis form factor in falciparum malaria: Cell-mediated responses? Vet Parasitol 1988;29:171-7.